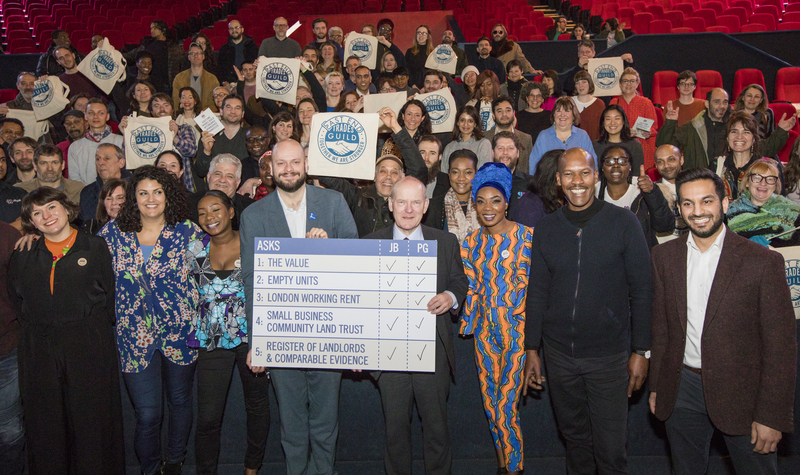 Yesterday morning 200 members and guests of the East End Trades Guild gathered at founders Genesis Cinema to witness the announcement of our historic Affordable Workspace Manifesto and play a role in live democracy as five proposals were put to the two incumbent Mayors of Hackney & Tower Hamlets, both up for re-election on 3rd May. The Hackney Conservatives and the Independent Group for Tower Hamlets were invited to our event but unfortunately they were unable to attend. Five stories highlighting the workspace crisis were told by EETG members, before five corresponding proposals were put to the two candidates John Biggs and Philip Glanville by Abi and Tayo Abimbola – Franceskka Fabrics, Leonard Maloney – JC Motors, Rosie Wolfenden – Tatty Devine, Maisie Collin – Maisie Poppins and Qusai Jafferji – Newmans Stationery. The EETG has won commitments from both politicians to work with us on all five proposals if they are re-elected on the 3rd May. This hard earned achievement is the culmination of over a year’s work with active members taking part in roundtables, trainings, listening actions, research and holding a great deal of meetings and discussions. ASK 1: THE VALUE – If elected, will you recognise the community value of small and micro businesses to your boroughs, understanding that we are essential to community wealth, the local economy, to culture and to heritage, and reflect this in all future economic and planning policy decisions? John Biggs – Yes. Small businesses are the bedrock of the economy, and of course the East End of London is perhaps the most entrepreneurial place in the UK. I recognise that just as residential rents are rapidly pricing people out of boroughs, commercial rents are doing the same. 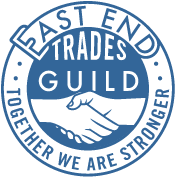 If I’m lucky enough to be re-elected on 3rd May, I want to sit down with the East End Trades Guild to make this work. Philip Glanville – Yes. The principle has got to be recognising different types of growth and how we explain this to residents visibly – perhaps using the EETG map to show really clearly the community value so that consumers choose small businesses. ASK 2: EMPTY ASSETS – If elected, will you help us identify at least one empty asset in the borough before the end of 2018, and work with us and our partners to bring it back to life for locally owned and run small businesses? Philip Glanville – Yes. We’re already working with the East End Trades Guild on empty properties, keen to hear about any further clusters of empty properties like the one that Len talked about. TfL is now changing the way it operates – the proof that your collective approach works. John Biggs – Yes. We want to encourage our small business sector to thrive. I’m keen to look at sustainable models. ASK 3: LONDON WORKING RENT – If elected will you commit to continue to work with us to arrive at a flexible formula of rental affordability for small and micro businesses before the end of 2018? John Biggs – Yes. We funded the first stage research. In the same approach that we developed affordable rents and a London living wage, we need to find the means to do this in a pioneering way. Philip Glanville – Yes. A percentage of a market that is out of control rapidly becomes unaffordable. The argument is won, we need affordable workspace and now we have to find out what is truly affordable and bottom this out through this research. 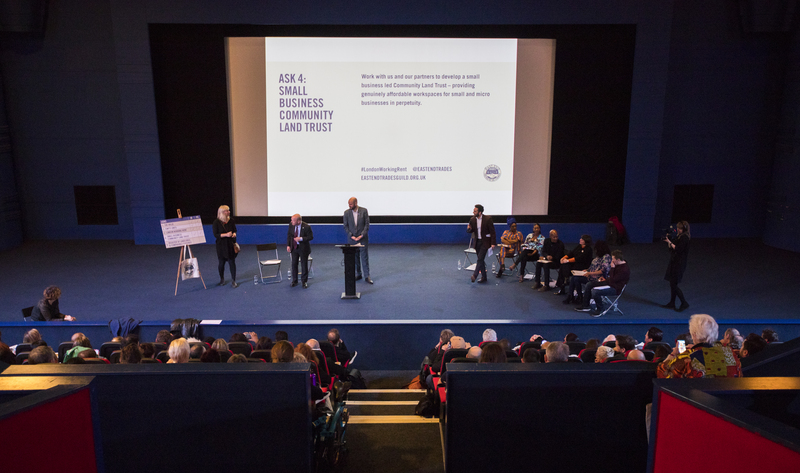 ASK 4: SMALL BUSINESS COMMUNITY LAND TRUST – If elected will you work with us and our partners to develop a small business led Community Land Trust – providing genuinely affordable workspaces for small and micro businesses in perpetuity? Philip Glanville – A Cautious perhaps – with any CLT, the challenge is where does the asset come from? Due to austerity we’ve suffered 130 million in cuts, we don’t transfer assets for free anymore. Your business case will be important it has to be a viable case that enables you to pay for an asset. That asset may be able to be transferred in a way that is outside of a market process – where we capture all the social value that is additional to the concept. It will all come down to the business case. John Biggs – Yes. One of my takes in a previous role at the GLA was to look at CLT’s as part of the Olympic legacy, there are now two in Tower Hamlets, one just announced in Cable Street. From speaking to CLT’s in Vermont I know that CLT’s are not just for residential, so if you can build a model that includes employment space then that’s a fine thing to do. Part of the answer is some kind of not for profit context, in which you don’t need to generate such a large rate of return, the return is looking at community wealth that is developed out of the asset. If we can find a way to do this I am happy to work on this, because it’s about securing the future of our communities. ASK 5: REGISTER OF LANDLORDS AND COMPARABLE EVIDENCE- If elected will you help us create access to comparable rental evidence to support small businesses in keeping rents reasonable, and enable stronger more accountable relationships with commercial landlords? John Biggs – The commercial property sector is very competitive and doesn’t disclose data willingly, but if you can have a research base that would help to redress the imbalance of power. It’s about securing the recognition of community based businesses, not everyone can pay the rents of KPMG. If we can work with you to help build the evidence base that gives greater power to your members then that is something I would like to do. There is a dissatisfaction about how the current economic model works, with a frustration that it doesn’t work for small businesses and local people. I would like to help redress the imbalance. Philip Glanville – Yes. To build an evidence base will rely on active partnership between both the Guild and the council, we can provide information from our own portfolio. The diversity of our economy is essential. A huge thank you to all who have given their time and skills to the development of this crucial work. This is just the beginning, it’s going to be a long road as we animate our manifesto! 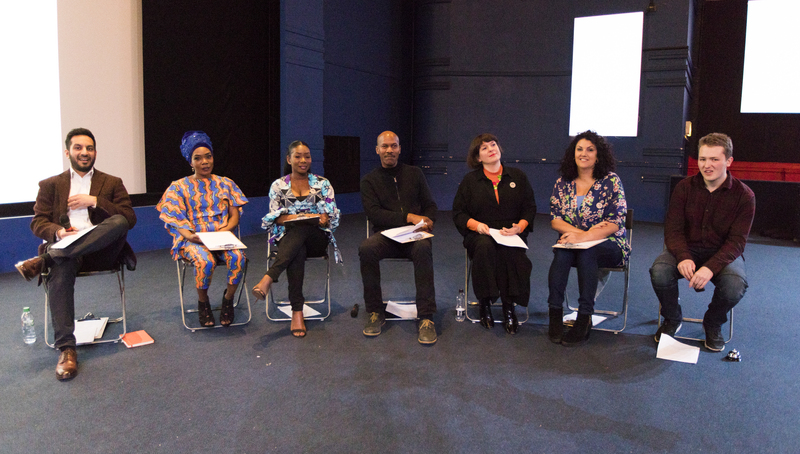 Particular thanks to Rachel Buntrock from members Soapbox for design of our manifesto, to Jeremy Freedman for the beautiful photographs, to Tyrone Walker Hebborn for use of the splendid Genesis Cinema and to our partners the New Economics Foundation.